Looking for something for sensation play? The Pleasure Feather can certainly help enhance a sexual experience. The softness of the feathers feels soft against the skin while still tickling and teasing as well. The handle is short and can sometimes be problematic, but overall this is a well-crafted piece that can find a place in anyone's toy chest. Well made, soft feathers, very affordable. Handle can be a little short. The Pleasure Feather by Sportsheets is designed so that anyone can pick it up and use it right away. If you are into sensation play at all you will find some use for this feather. The feathers are soft and feel fantastic against the skin and can be used on all parts of the body. The toy itself is made from soft feathers that are of different lengths and thickness and are attached together by a plastic piece running through the center of the Pleasure Feather, which is 1" long. The feathers are attached around the plastic piece in the middle, and the plastic piece is also where you grip the Pleasure Feather when you are using it. There is a nylon strap that measures 5" long and is attached to the bottom of the Pleasure Feather where you can put your wrist through and hold onto the plastic handle. The feathers are very soft to the touch and have no discernible smell. When I pulled out the tape measure the Pleasure Feather measured 12" long, but that was from the tip of one feather to where the nylon strap was. The length could differ based on feather positioning and length of individual feathers on each Pleasure Feather. The feathers are of different lengths, some are short, some are medium and I have two long feathers near the middle of the Pleasure Feather. 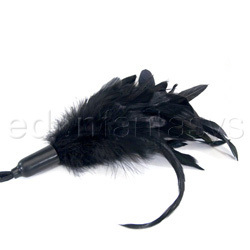 The Pleasure Feather comes in several colors, Black, Rose, Red and Violet. We chose black because honestly that was what was in stock at the moment. I do not know what type of feathers these are, but they feel wonderful against the skin. We pulled and tugged these feathers several times and have used it several times and have not had a feather become damaged or come loose as of yet. The Pleasure Feather works great for its intended use. You can definitely tickle your partner by running this along their skin. There is very little drag against the skin and by changing the way you move the Pleasure Feather you can change the sensations that your partner experiences. The experiences can also differ based on whether or not you single out individual feathers and run them along the skin or if you push the entirety of the Pleasure Feather against the skin you will experience different sensations. The nylon strap and small handle can be difficult to learn to maneuver with at first, but as you get used to the Pleasure Feather I became more adept at running the feather along my wife's body. It is different from using other feather ticklers, and once you become used to how this works you will have more control over what your partner is experiencing. There was little packaging with the Pleasure Feather, it only came attached with a hanger tag that had some suggestions about ways to use this toy, such "Naughty Housekeeper," "Connect the Dots" and "Tender Genders." Otherwise it was just placed in the box and was not in a plastic bag or anything like that. Do not get this product wet, I think it would ruin the feathers if it was to get wet. If you are using lubricant in your play I would advise keeping the Pleasure Feather as far away from the lubricated area as possible. With storage you should take care to make sure that the feathers aren't damaged when not in use. Storing this in a drawer would be a good idea, but also we use the nylon strap to hang the Pleasure Feather in my closet. I put a nail into the wall and hang this upside down while it's not in use. When we pull it out to use it, I usually fluff the feathers for a moment and then it is ready to go. The handle can be tricky to learn to use, but after you do this is a very well made toy. The feathers are secure within the plastic handle and feel fantastic against the skin. A great product for beginners and useful for those who are more experienced with this type of play as well. This feather is still holding up well. It's a little dainty for use, but with a feather you're aiming for a lighter, more sensuous touch anyway, right? If this had a better handle to it I would be in love with it, as my wife loves to have feathers run across her skin, but it's still a little awkward for me. But overall still a very useful item to have. Thanks for the review, this one looks like some fun! !